FORMAL INVESTIGATION - A Formal Investigation was undertaken by P/O D.E.J. Stocker (37 Squadron) into the loss by theft or otherwise of a Royal Enfield Motor Cycle, RAF.19700 on the 6th September 1944. September 9/10, 1944: The railway system at Ravenna and the system behind the front line of battle was largely disorganized and the enemy was making extensive use of the canal at Ravenna for bringing supplies up to the front line. The object of the nights attack was to destroy supplies and unloading facilities on the canal wharves adjoining the marshalling yards at Ravenna. Detail view of target taken from MacIsaacs aiming point photo of the September 4/5’s attack on the Ravenna marshalling yards. The canal runs diagonally near the center of the photo. Note the bomb bursts and flak batteries just below the canal. The oval shaped object on the left containing many AA guns is a soccer stadium. F/Sgt. James MacIsaac took off from Tortorell at 2110 hours carrying nine 500 and seven 250 pound bombs. As their usual aircraft was still undergoing repairs after being hit by flak on the night of September 2/3, he and his crew flew Wellington Mk.X LP329 - "S". Nine Wellingtons of 37 Squadron were detailed and all attacked, dropping two 4000 pound bombs, sixty 500 pound bombs, forty seven 250 pound bombs and 72 packets of leaflets between 2313 and 2317 hours from altitudes of 5500 to 5900 feet. MacIsaacs aiming point photo taken September 9/10 over Ravenna. A large ring, dead center and over half the width of the photo, is the result of the shock wave from a 4000 pound bomb. TI’s are clearly visible (note the two glowing spots in the upper right quadrant of the "ring"), along with scattered AA tracer fire. The edge of the soccer stadium can just be seen in the upper right. MacIsaac bombed on the red TI’s between the canal and marshalling yards at 2316 hours from 5500 feet on a heading of 315 degrees. No results were immediately observable. He reported seeing a small fire and three "sticks" of bombs fall across the target. 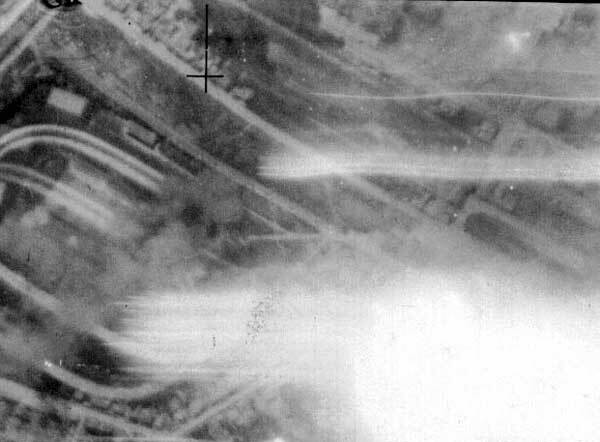 Illumination was good, the red TI’s fell close to the wharves, and bombing was well concentrated on the target. Opposition consisted of slight, inaccurate, heavy and light caliber flak. No fighter activity was reported. There were no losses and all Group aircraft returned safely to base. 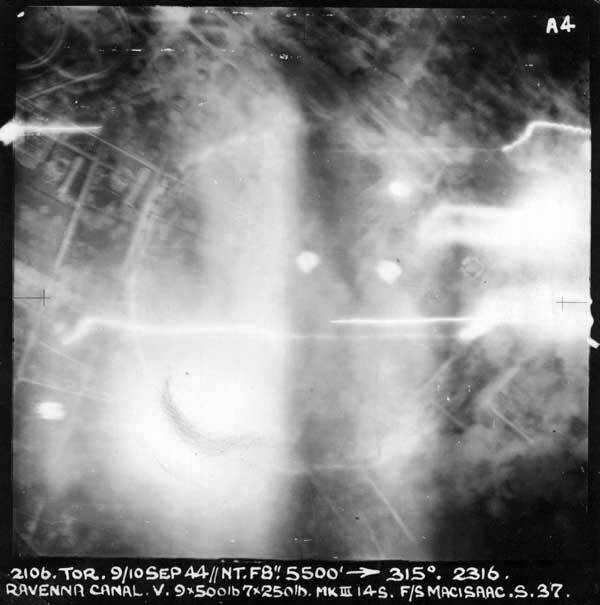 All aircraft took photos, six of which were on target and on the correct heading. The Wing "best photo" was won by 37 Squadrons "B" flown by F/Sgt. Wilson. F/Sgt. MacIsaac and crew touched down at Tortorella at 0053 hours.